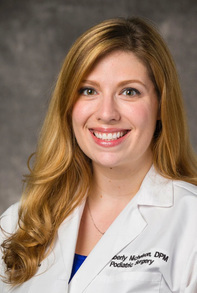 Dr. Kimberly Nichelson will be completing an advanced three-year foot and ankle surgical residency program through University Hospitals of Cleveland Richmond Medical Center and affiliated Cleveland-area hospitals and joining the practice in July of 2016. Dr. Nichelson's expertise in complex foot and ankle reconstructive surgery, diabetic wound care, and sports injuries, along with her gentle and compassionate bedside manner enables her to provide you with the highest quality of medical and surgical treatment for your foot condition. ©2016 Roger L. Friedman, DPM - Podiatrist. Foot Doctor for Northeast Ohio including Amherst, Avon, Avon Lake, Bay Village, Elyria, Lorain, North Ridgeville, Sheffield Village, Grafton, LaGrange and Oberlin.